At the 2004 Windy City Pulp and Paperback Show, I was on a mission. Obviously, I was looking for pulps, originals, books, and any other miscellanea that struck my fancy. But my mission went even beyond that. I’ve been to every annual Windy City show since it started in 2001. In the years since, I’ve picked up lots of small-press publications that reprint the kind of pulp fiction that makes me smile, clench my teeth, widen my eyes so that the whites show all around, and chuckle insanely, causing my wife to wake in alarm and order me to turn off the light. And when I did finally turn out the light, I could not easily fall asleep. It was rage that kept me awake. The seething resentment that had built up, causing my skin temperature to rise, as I read publication after publication. How could they publish books with all those typos? Didn’t anyone actually read them before the manuscripts were sent off to the printer in Timbuktoo? I think, also, that my error-catching mindset is due to the fact that I deliberately chose to never mentally skip over errors. I remember a nice lady that my mother knew, when I was ten, lending me some science fiction paperbacks. Even back then, I didn’t let the publisher get away with anything; I circled and corrected each error with my orange-ink cigar-pen before I returned them to her. In contrast, most normal people would shrug it off. An error? OK, I know what it should be; let’s move on. But for me, it’s like tripping over a carpet. You put a lot of work into your book or periodical. But your publication’s attractive, professional look is all too easily undermined–made amateurish and substandard–by only a handful of typos. I can help! My eagle eye, and mastery of the English language, make my proofreading skills and ability to spot typos unsurpassed. And I’ll do it for free! !–the first time I work with you. Thereafter, you’ll find my fees so reasonable, my services so invaluable, that you wouldn’t consider going to press without first subjecting your manuscript to my stern scrutiny. Have a project in the works? Please e-mail me! It was no idle boast. Proofing that nearly 800-page set of 38 stories was about all I did for the next few weeks, but I got her done. The absolute worst aspect of that job: I did not have the source material. So I was left guessing on a lot of mysterious typos, which will no doubt lead to pulp fiction historians, centuries from now, sneeringly making light of my work on that edition. Dr. George has provided me, for subsequent projects, with that much-needed source material, so I have been able to check the input whenever that wacky OCR program has garbled up the output beyond all recognition. 2005, The Compleat Adventures of the Green Ghost, by G.T. Fleming-Roberts. Edited by Garyn Roberts. 2 volumes. 2006, The Compleat Great Merlini Saga, by Clayton Rawson. 2 volumes. 2006, The Compleat Park Avenue Hunt Club, by Judson P. Philips. Edited by Garyn Roberts. 2 volumes. 2007, The Other Seabury Quinn Stories, by Seabury Quinn. 2 volumes. 2009, The Compleat Saga of John Solomon, by H. Bedford-Jones. 3 volumes. 2009, The Macabre Quarto, by August Derleth (jointly published by the August Derleth Society and Arkham House). 4 volumes. 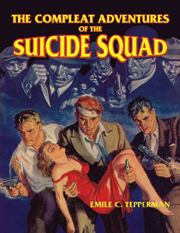 2009 (forthcoming), The Compleat Adventures of The Suicide Squad, by Emile C. Tepperman. Incomplete and unpublished, The Strange Ocean Vistas of Philip M. Fisher. In-process, The Compleat Adventures of Luther McGavock, by Merle Constiner. In-process, The Compleat Adventures of Satan Hall, by Caroll John Daly. It was Bob Weinberg’s idea in the first place. I discussed the project with April Derleth since her father had published two volumes of Whitehead’s fiction in the 1940’s — Jumbee and West India Lights. April agreed and I borrowed the Arkham archival copies of the two books in dustjacket. plan to the art work from the two Arkham editions and add a third volume containing other uncollected stories from the pulps. One story “The People of Pan” that was already collected merited a Weird Tales cover, and that story will be published in the third volume. Right in the middle of this project I learned that Christopher and Barbara Roden of Ash Tree Press were also publishing the same project in three volumes, and the first volume had already been released. The stories were already in the public domain when Derleth published them, so there was no question of infringing any copyrights. Before I can project I still have to find three of the stories, and one correspondent has advised there may be some more htat don’t have bibliographic data available which makes them even more difficult to locate. I append the list below, if anyone can assist I would be most grateful.